Using a basting brush, spread oil on the both sides of the Tilapia, then place on a baking dish. Mix the dried basil, cajun seasoning, and ground black pepper in a bowl until you see equal consistency. Sprinkle the mixture evenly over the Tilapia. Place the Tilapia in the oven and cook for about 10 minutes, or until it starts to flake. Place the oven on broil and let it cook for about 45 more seconds. If you do not like the top well done, then skip this step. Remove from the oven and enjoy. This cajun Tilapia dish goes well over a dish of rice and a side of steamed vegetables. Pair it with a nice red wine, and you have the perfect meal! Tilapia is a farm grown fish and has grown to become one of the country’s most popular types of fish to eat. 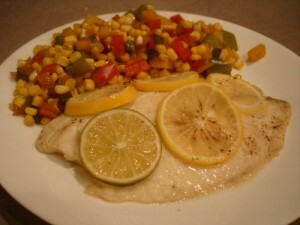 Tilapia is better for you than other fish because it is farm grown and fed a vegetarian diet. Unlike most other fish, it has a significantly low mercury content.